WARNING: *Results may vary. Check with your physician before beginning a supplement program. Achieve your health and fitness goals by following each of the sections: nutritional information, strength workouts, cardio exercises, and the 21-Day Fast Track Meal Plan. Whether you’re looking to eat better, get stronger, slim down or just live healthier, Complete Nutrition® has you covered. 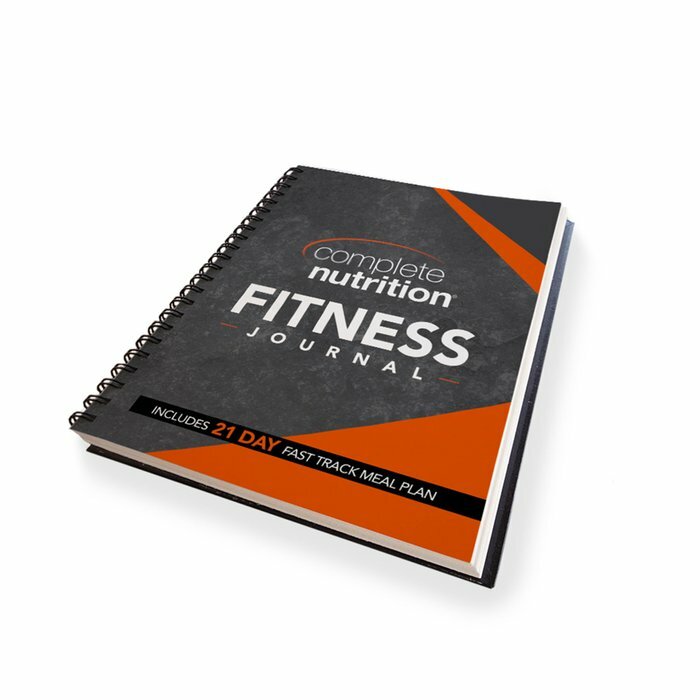 Introducing the Complete Nutrition® Fitness Journal. This 120-page journal has everything you need to achieve your health and fitness goals, including nutritional information, strength workouts, cardio exercises, and the 21-Day Fast Track Meal Plan. The Complete Nutrition® Fitness Journal consists of 6 sections, each designed to improve a specific part of your health lifestyle. Explore each section and see what the Fitness Journal has to offer you! NUTRITION: The Complete Nutrition® Fitness Journal begins with a comprehensive section on all-things nutrition. In this section you can learn about protein, carbohydrates, fats, and what affects they have on your body. We’ve also included a useful list of Health Guidelines to help you maintain healthy habits and stick to your goals. Being informed when it comes to nutrition is crucial to ensuring that you’re living healthy. It’s important to understand what nutrients will bene t you and how to best t them into your daily lifestyle. Use this section to discover what’s good, what’s bad, and why. 21-DAY FAST TRACK MEAL PLAN: If you have a busy lifestyle and are looking to make a healthy change, this meal plan is perfect for you. Created by our Registered Dietician, the 21-Day Fast Track Meal Plan is designed to get you results in just 3 weeks. We’ve done all the work for you and laid out 3 entire weeks’ worth of meals. By sticking to 6 specially chosen meals each day, your body will receive steady energy throughout the day while boosting your metabolism. With ready-to-follow meal plans and a “healthy options” segment, looking and feeling your best has never been easier! STRENGTH: The Strength section of the Complete Nutrition® Fitness Journal features a detailed workout plan complete with exercise breakdowns, strength tips, and a clear-cut exercise routine. We’ve included 30 upper and lower body exercises with detailed instructions on proper completion so you can pinpoint exactly which muscles you want to work on. Combine these workouts with exercises in the CARDIO section for a balanced fitness schedule. We’ve even incorporated an area for you to plan your exercises and track your progress as you go. Use this section to improve your strength and watch as you shed fat and build muscle! CARDIO: No matter your goals, cardiovascular exercise is an essential part of any fitness routine. Learn about the benefits of cardio exercise and how to determine your target heart rate when you work out. We’ve also included a cardio activities segment which details all the different ways you can t cardio exercises into your lifestyle. Try any of the 3 specially designed workouts included and in no time you’ll enjoy exercising like never before! Choose your exercises based on your pace and experience, then watch as your endurance improves. SUPPLEMENTS: Whether you’re trying to step up your workout game or shed excess weight, Complete Nutrition® is dedicated to providing the best possible products to help you maintain a healthy lifestyle. Proper supplementation can boost performance, aid in recovery, and step your workout game up to the next level. Explore some of the top Complete Nutrition® products designed to help you maximize your workouts and accelerate your progress. Find the product that works for you and watch as your workouts improve and your results increase! BODYCOMP™: Understanding your body is crucial when setting health goals and deciding how you can achieve them. Learn about the exclusive BodyComp™ Analysis offered at every Complete Nutrition® location. To get a comprehensive breakdown of your body based on muscle, fat, calorie usage, and a number of other factors, visit your nearest Complete Nutrition® store. BodyComp™ goes beyond a scale by measuring.